Core recently partnered with Girls on the Run Northern Virginia on its annual spring 5K event. Held in both the Arlington and Woodbridge locations, the 5K is the culminating achievement for thousands of local girls participating in the Girls on the Run program and is considered a celebration of steps they have taken together towards more joyful, healthy, and confident lives. Core was thrilled to sponsor Mile Marker 2 at the Arlington race, held Sunday, May 15 and this group of young ladies rounded out the program for the year and we look forward to continuing to support this important local group inspiring and supporting young women in all of their fitness goals. Girls on the Run is a transformational physical activity based positive youth development program for girls in 3rd-8th grade. Teaching life skills through dynamic interactive lessons and running games, the goal of the program is to unleash confidence through accomplishment while establishing a lifetime appreciation of health and fitness. Girls on the Run of Northern Virginia is an Independent Council of Girls on the Run International, which has a network of over 200 councils across the United States and Canada. 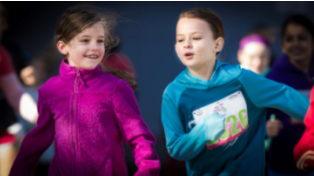 To learn more about Girls on the Run Northern Virginia or to view their fall running schedule for the 2016 season, visit them at their website.